Today’s sponsor is Reverse Confetti and I did not have any stamps from them. I do have the All Framed Up Die which is one of my ALL TIME FAVOURITES, so I wanted to use it here. I took inspiration from Michele Ferguson who used a reinforcement die to turn a frame into a tag. The image in the tag is from Hero Arts Naughty Elves. Posted on November 9, 2017, in Card Samples, Challenge Entries, Debbie's Challenge Entries, Oscar's (Deb's) Card Samples and tagged Hero Arts, Reverse Confetti. Bookmark the permalink. 2 Comments. So happy to inspire, Deb!! 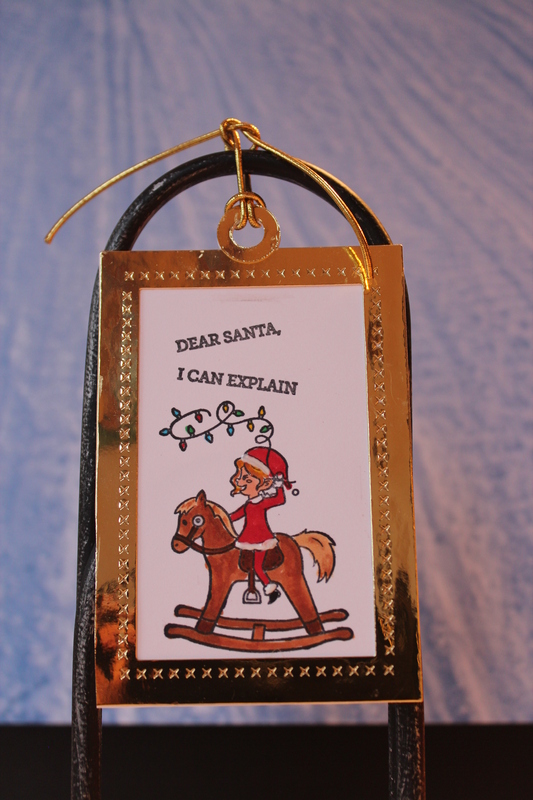 What a gorgeous, shiny, perfect little tag – and this is what I tell Santa EVERY year!!! CUTE tag! 🙂 I like the die and shiny paper you used!